(More files and FAQs here) Oh, holy moly. 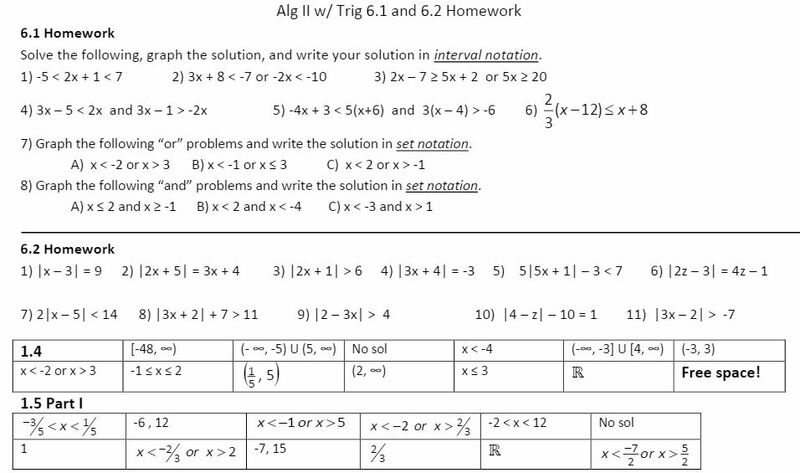 I thought it was a good plan to have all the inequalities in one chapter, like I did with equations and graphing. 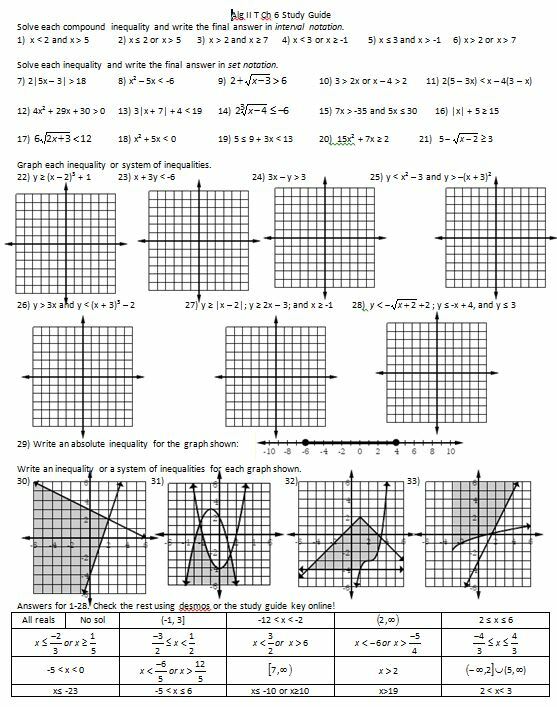 We could revisit all of our graphs and equations again, notice similarities/differences…yeah, not so much. Much like any traumatic event, I’ve blocked out many of the details. I just remember ending each period completely frazzled. So, well, here you go. Do with it what you will. (file) I tried doing the “test each region” method of compound inequalities. I’m pretty sure I don’t like it and prefer the draw-each-number-line-then-shade-overlap method. (file) Hey, you know what would be really cool? If we did a notice and wonder with some pre-solved absolute value inequalities! 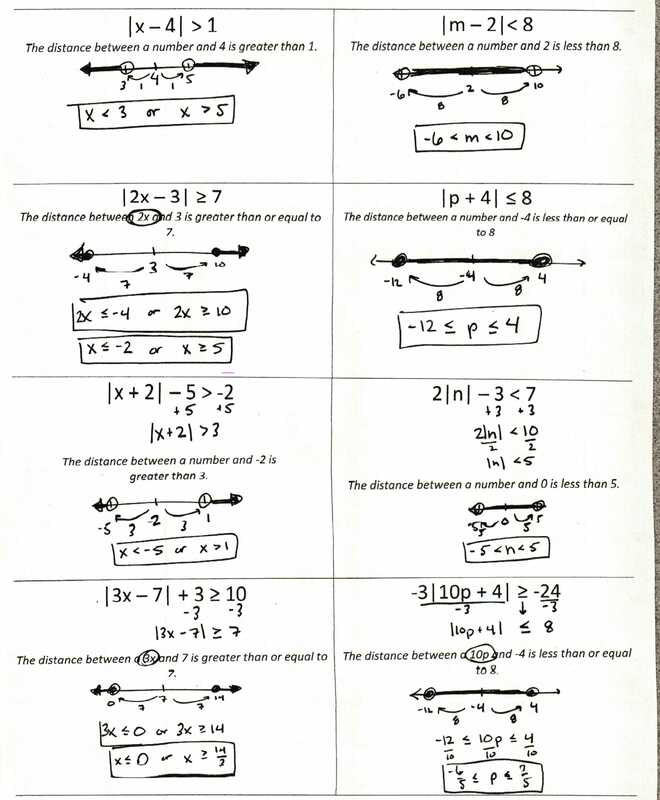 (blank file and file with solutions) Oh, wait, I meant “not cool.” How I was being tested this day, when after 10 minutes one group’s contribution was “they all had absolute value bars.” So we did some formalized notes the next day. (file) I just really don’t want to talk about absolute value inequalities, okay? Let’s talk about something more pleasant, like two-variable inequalities. Happy sound of everyone shading! (file) No. Just no. To be honest, even though it’s in Algebra II, I’ve always kept these until Precal and taught it using sign charts. I think that’s a good place for it. We did all love some systems of two-variable inequalities! (file) You can see here I went back to the draw-two-lines method of finding the solution. (file and video key part 1 and part 2) And I think that’s all I want to say about this chapter! !